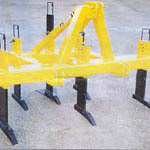 James Engineering Ltd started over 25 years ago, producing subsoilers and mole ploughs. The company, started by Des James, has since become leaders in soil aeration equipment in New Zealand and produces a range of well engineered, high quality machines. Located near Gore in the South of New Zealand, James Engineering Ltd employs a team of dedicated and experienced staff who take pride in the reputation of the company and strive to ensure the highest possible standards of engineering excellence. The company’s products are sold throughout New Zealand, represented by a network of loyal dealers. Equipment is also exported to a number of countries, which is a testimony to the quality of the machinery and to the competitive pricing of such durable and trouble-free equipment.